It was a warm, bright morning as Mayor Rothschild spoke to a large crowd at the U of A mall, along with many other politicians including Karen Uhlich, Regina Romero and Richard Fimbres. There we were, right up front, with two large Tucson Bus Riders Union banners. As we listened to them speak about justice, equality and human rights, a new hope began to arise that we could possibly work with our all-Democrat City Council members to insure that fares are not increased, routes are not cut, and that there be a true, transparent public process in the development of The Ronstadt Transit Center, insuring that its development truly benefits the bus riders and improves the transit system. Once the march to Randolph Park began the Bus Riders Union Team started working the crowd, handing out fliers and informing people of the city’s plan to discuss fare increases on Wed. Jan. 22nd at City Hall. I spoke to many people that were very upset by this topic. One gentleman was so angry that we discussed it for nearly five minutes. He told me that it was nonsense, and that the only reason they are discussing fare increases is to pay for their precious street car. He said that it’s not right that we [bus riders] have to pay for something that most of us will never use. I agreed and invited him to join the Bus Riders Union before continuing to work the crowd and hand out fliers. The crowd was upbeat and enthusiastic. The music and performances were wonderful. This was the perfect event to reach out to fellow bus riders and our supporters and spread the word about our Membership Campaign Kick-off on Wed. Jan. 22nd at 2:00 in front of City Hall, 255 W. Alameda. Please join us and sign up for your official Bus Riders Union Membership. 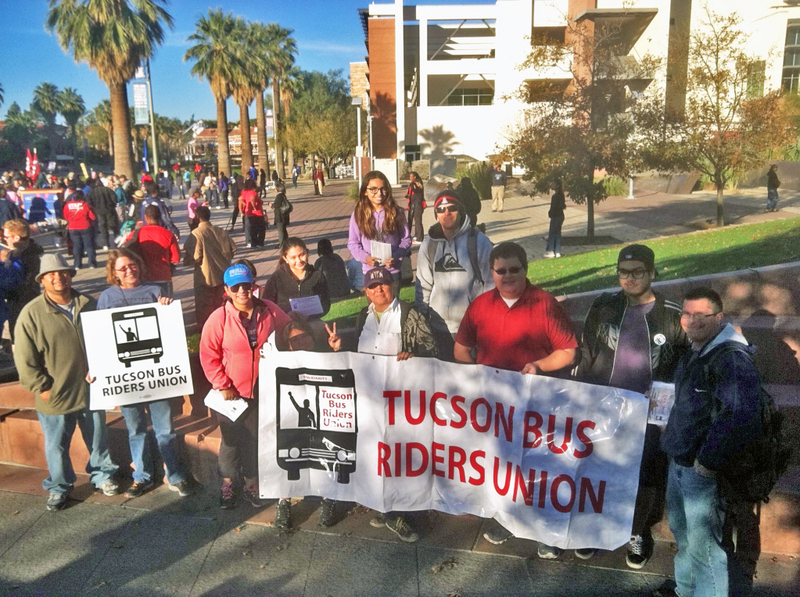 Until the City Budget is finalized in April or May, the Tucson Bus Riders Union plans to sign up ONE THOUSAND bus riding members and their supporters in addition to membership from churches, unions, neighborhood groups, businesses, etc. Hopefully the City Council members will hold true to their words of justice, equality and human rights by stopping the war on the poor and not balancing their budget on the backs of those who can least afford it.